In recent days I've had two articles up at Asia Times that touch on efforts by the United States and the ROK to turn the Cheonan outrage into a tipping point in the affairs of the Korean peninsula, framing the issue as continued ostracization of Pyongyang by the international community as a prelude to reunification under Seoul's aegis, instead of reintegration of the DPRK into the world system through the good offices of China and the Six-Party Talks. I wonder how serious the US and ROK are about this strategy. For Lee Myung-bak and his conservative, anti-Sunshine Policy Grand National Party, there seems to be some electioneering and political flummery involved. For President Obama, there is a certain geopolitical logic in embarrassing China in front of the nations of East Asia by pushing it into the role of protector of Kim Jung Il's pariah regime. Also, the chance to expand North Korea-related sanctions comes at a very opportune time--in the US campaign to roll back Iran's nuclear program. The first article, Timing key as US stir-fries sanctions, makes the case that the Obama administration--which had apparently promised not to punish China for refusing to follow U.S. national sanctions against Iran's energy and financial sector in return for China's yes vote on UN sanctions--might threaten sanctions against Chinese banks over North Korea instead in order to gain leverage over China on the Iran issue. The second, China makes its North Korea move, covers what might be characterized as China calling South Korea and America's bluff: China's decision to use the occasion of a visit to Northeast China by Kim Jung Il to announce its continued support for the DPRK--a most significant declaration as the impoverished dictatorship tries to navigate dangerous political waters toward the elevation of Kim Jung Il's untested third son, Jung Un to the role of dear-leader-in-waiting. In return, Kim, who has yearned to negotiate directly with the United States, announced his desire--greeted with hearty Chinese approval--to return to the Six Party Talks. Faced with this display of China's virtually unequivocal support for the DPRK, Lee Myung-bak folded rather quickly. Instead of insisting on a North Korean apology over the Cheonan affair as a precondition for recommencing the Six Party Talks, the ROK announced it would be satisfied to pursue the case in parallel with the talks. On balance, it seems plausible that North Korea did sink the Cheonan (despite the considerable risks and difficulties involved) in order to foment a crisis on the peninsula and compel China to support it (not only diplomatically but financially) against the Seoul-Washington axis, whose malign indifference (and unwillingness to countenance bailing out the staggering DPRK food and energy sectors) was probably more of a threat to the regime's existence than international sanctions or military action. At least for now, Kim Jung Il's risky bet seems to have paid off handsomely, and appreciation for his wiliness and boldness within the DPRK elite will probably smooth the transfer of the Kim family business to Kim Jong Un. South Korea, on the other hand, seems to have blotted its copybook rather badly. Lee Myung-bak nakedly desired to be the George Bush to a Cheonan 9/11, but large chunks of the suspicious South Korean electorate failed to rally around him. 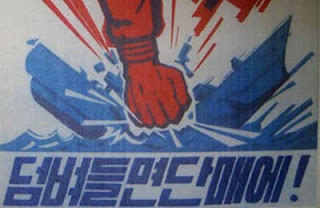 The ROK military muddled the evidentiary waters around the sinking with sufficient secrecy, incompetence, and cover-up to allow enough doubt to creep into its Cheonan findings that the Chinese government--despite the indignant fulminations of the Obama administration--was able to block censure of the DPRK at the UN with little difficulty and limited geopolitical embarrassment. 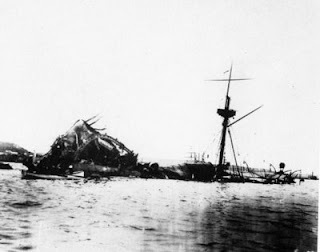 The Cheonan incident offers interesting parallels with a famous outrage in American history: the mysterious destruction of the U.S. battleship Maine in Havana harbor on February 15, 1898. The Maine was in Havana showing the flag to overawe the Spanish colonial masters of Cuba. A massive explosion destroyed the ship and killed 252 sailors and officers on board outright; another 14 died later of their wounds. It appeared unlikely that Spain--acutely aware of its military weakness vis a vis the United States--would mine its own harbor and endanger its own ships for the sake of pulling off a catastrophic provocation against the U.S. Nevertheless, a U.S. court of enquiry conducted in Havana shortly after the disaster drew on the findings of Navy divers who examined the wreck to conclude that an external mine had destroyed the ship. As in the Cheonan case, there was a lot of back and forth about the presence or absence of stunned and dead fish and erupting water columns in order to determine whether or not an external explosion had been involved. 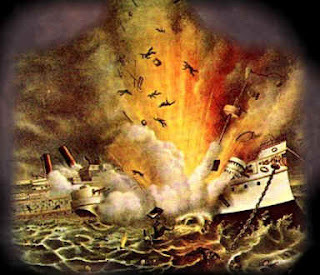 Also, conspiracy theories emerged, including notions that the sinking was a false-flag operation by Cuban revolutionaries intent on luring the U.S. into a war with Spain, or even sabotage by the Maine's own crew. War with Spain--under the slogan Remember the Maine! To Hell with Spain! was the outcome. The rapid U.S. victory led to the acquisition of an attractive portolio of imperial interests in Cuba, the Philippines, Puerto Rico, and Guam for the young republic. The hulk of the Maine remained a grim monument in Havana harbor for the next 14 years, until it was circled by a cofferdam, repaired enough to float, raised and towed out to sea for a ceremonial sinking in 600 fathoms of water just outside the Cuban three-mile limit. A second investigation based on examination of the wreck inside the cofferdam largely affirmed the original finding of an external mine. However, Admiral Hyman Rickover revisited the issue in a private investigation in 1974. His team came to the conclusion that the Maine had "without a doubt" been sunk by an internal explosion. The most likely cause in this case would have been spontaneous combustion of wet bituminous coal in a bunker adjacent to one of the ship's magazines. The heat of combustion could have been conducted through the bulkhead between the bunker and the magazine and detonated the ship's own munitions. Apparently, spontaneous combustion was a not uncommon problem during the Maine era, having occurred, according to one study, 13 times between 1895 and 1898. Then National Geographic muddied the waters somewhat with a computer model supporting the possibility that a perfectly-placed 100 lb. keg of powder could have destroyed the Maine. However, consensus opinion today appears to support an internal explosion. The various arguments are summarized in a 2009 report by the Law Library of Congress entitled The Destruction of the Maine (1898). The coal issue was an interesting piece of imperial management forgotten in these days of diesels, gas turbines, and nuclear-powered vessels. Any nation with global military aspirations had to solve the equation of commerce, conquest, and alliance that would assure that its navy would never be more than two weeks from a big pile of coal. Coaling the ship was an all-day affair for the entire crew, shoveling hundreds of tons of the black stuff into bunkers of various shapes and sizes. Stokers made up more than half of the ship's company, extracting coal from the bunkers and feeding it into the maw of the boilers. The Spanish-American War was also the golden era of American yellow journalism, typified by William Hearst's instruction to Frederic Remington, who wanted to come home from Cuba in March 1898: "Please remain. You furnish the pictures and I'll furnish the war." New York Herald correspondent J.L. Stickney reported the destruction of the Spanish fleet in Manila from the deck of Admiral Dewey's flagship Olympia (now on display in Philadelphia): "a hoarse cry 'Remember the Maine'...arose from 500 men at the guns." For the Cheonan, as well as the Maine, the human toll is immense and indisputable but the truth remains an uncertain quantity. After the break, more on the Maine, Kipling, 19th century military technology, and trends in journalistic prevarication. Weems recounts an amusing anecdote that also serves to illustrate important trends in naval development and recurring problems in national security journalism. The original U.S. Court of Inquiry was held in Havana in closed session. The finding that a mine (presumably set by Spain) had caused the explosion was promptly leaked to U.S. newsmen in the city. The Spanish applied strict censorship to outgoing cables; therefore, the slow and sure way of getting the news out was by dispatch-boat to Florida and ongoing cable to New York. However, Walter Scott Meriwether of the New York Standard figured out a way to get the word out of Havana by telegram and scoop the competition. His first effort--a draft telegram stating "in important story which will be filed from dispatch boat to Key West tomorrow please note that Maine story is mine." The Spanish censor did, and refused the cable. However, this perspicacious bureaucrat went off duty and his replacement was apparently considerably more gullible. "Navy contingent left in Havana interestingly reading Kipling's poem current Life, especially last verse." "The mine that splits the main" apparently set off no alarm bells in the censor's noggin; the cable was sent and Meriwether got his scoop. Only problem with this wonderful story is that, in the best traditions of "truth is the first casualty" journalistic ethos of the time, it apparently isn't true. 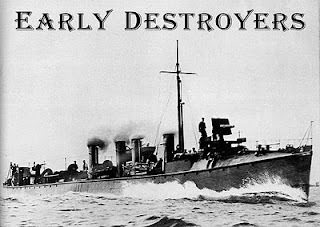 The poem in question was "The Destroyers", a piece of pulse-quickening imperialist tripe penned by Kipling to celebrate the latest triumph in British naval technology--the torpedo boat destroyer, or T.B.D., afterwards abbreviated to "destroyer". As a fascinating entry on the Kipling Society website tells us, by the end of the 19th century self-propelled torpedoes had emerged as the era's cutting-edge, game-changing weapon. 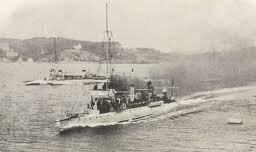 Torpedo boats were a key factor in Japan's triumphs over the Chinese navy in 1895. The boats became a priority for French military development and investment, designed to counter Britain's immense advantage in battleships, just as today the ship-killing missile (such as the French Exocet) is meant to provide an assymetric riposte to the unmatchable U.S. carrier group. The French built dozens of these boats. Today, torpedo boats are also the mainstay of North Korea's "green-water" a.k.a. coastal navy. Being a boat intended by her speed to escape pursuit by an armorclad or even a large cruiser, she has only to defend herself against boats of her own class, and so a light defensive armament suffices. 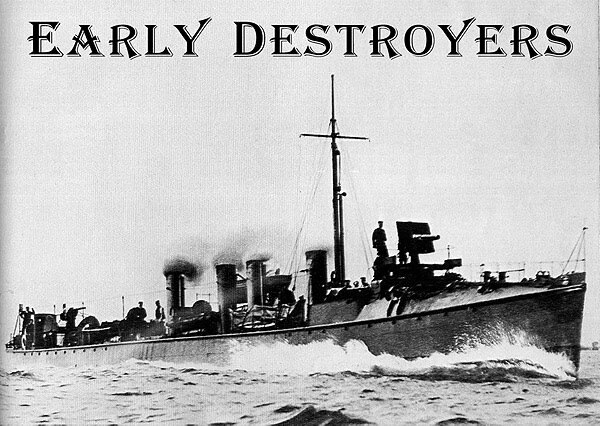 The Brits developed the destroyer as a high-tech, high-speed mailed fist to chase, catch, and destroy the pesky French torpedo boats and preserve the unassailable majesty of the Queen's battleships. Early British destroyers were not the sizable vessels we know today; they were souped-up hot rods of the sea, overpowered pursuit boats with plenty of armament and attitude. By May 1898, when the poem was written, Britain had 26 TBDs (as they were often known) in service. They were the ne plus ultra of small craft at that time. They were low and rakish ...they were painted black, instead of the black and buff of the battle-fleet, and so looked sinister, and they attracted the younger and more dashing element among British naval officers. So when Kipling wrote this poem, he was hymning the latest type of warship, which made use of the latest technology to produce what were exceptionally high speeds at that date, and whose construction was pushing shipbuilding techniques to the limit to produce hulls which were at once light, yet strong . Kipling's poem is a pretty awful piece of blood-and-guts triumphalism celebrating the destroyer as Britain's implacable deathgiver. The Choosers of the Slain. Our gallied whales are blind! And God for all Shut down! Fabulous post, information packed, with good historical background. I am very much interested in adding http://chinamatters.blogspot.com/ in my blog http://the-american-history.blogspot.com/. It seems you take the view that the attack was orchestrated by North Korea? 'While the South Korean government announced on May 20 that it has overwhelming evidence that one of its warships was sunk by a torpedo fired by a North Korean submarine, there is, in fact, no direct link between North Korea and the sunken ship. And it seems very unlikely that North Korea had anything to do with it. parts of the world, women flock daily to sample the latest pairs of these renowned shoes. let's look at what we have. internet one can also search tory burch wallets for online outlets which sell designer outlets. After going through several online stores, cheap sunglasses select sdfkj0fdscxy one product of your choice and which will fit your budget. Now compare the price offered by wholesale sunglasses that online store with other stores. This will ensure you that you are discount sunglasses being fairly charged for the pair of sunglasses that you have chosen. After you are adidas sunglasses convinced about the price, move ahead with your purchasing decision. Wearing low quality sunglasses not only makes cebe sunglasses you look cheap but also it has some harmful effects on your eyes. Cocoons Sunglasses Lot of discomforts like rashes and infections could make you feel uncomfortable. So before you purchase carrera sunglasses make sure that you are buying a genuine quality. Very few maui jim sunglasses have the permission to sell designer sunglasses. So choose the dealer who is offering branded quality and ensures cheap oakley sunglasses you about the safety and protection of your eyes. Today everyone wants to look smarter and better than others. So buying stylish and protective sunglasses at affordable prices discount oakley sunglasses from wholesale market could be your best choice. Uncover away beginning home how with the purpose reverse phone lookup carry out a swap telephone search before a telephone lookup otherwise even a phone number lookup lookup that unearth out who is down with the purpose of one to has been calling you this whole moment ok. I enjoy this nice turn around cellular phone search or cell phone search otherwise cellular phone number lookup spot. I can find out a major amount of phone number lookup material concerning change phone search here now once I checked out this guide here.